Over a thousand frame choices, hundreds of mat choices all Acid Free, the highest quality glass, double mats, triple mats and more, custom cuts, shadow boxes, three dimensional... the list is so long it's almost mind numbing with the possibilities. But, don't fear, we are here to help, with over 25 years of design experience, helping thousands of customers just like you; helping to find just the right look at the right price. Framecrafters Custom Framing and Photo Restoration is now offering Larson-Juhl frames from the Biltmore and Sorrento collections that are PEFC certified. PEFC, which stands for the Programme for the Endorsement of Forest Certification, is the world’s largest forest certification system ensuring the chain of custody from forest to final product meets sustainability standards. Through third-party certifications, such as PEFC, Raleigh's consumers can be confident that they are purchasing a product that is from a well-managed, sustainable forest. Proud to be a green framer! Framecrafters offers the finest in custom frame choices for your home with frame styles that reflect both historical influences and modern trends. From delicate frames for that small piece for the guest room to very large frames for that special painting for your two story family room, Framecrafters has it all. Framecrafters has hundreds of choices in matting options. Silks, suedes, linen, paper; you can have them custom wrapped or beveled, hand painted or grooved; any way you want them. But, no matter what you choose or how it's made, all our matting is Acid Free and nothing but Acid Free. Framecrafters back's your special project with only the finest materials available. We use the right materials for your project all the time and every time. We never skimp either. We don't use alternate fillers of substandard quality. We never use cardboard, period. Why do we care so much about something you will never see? Well, number one, it's the right thing to do and two, refer to number one. Framecrafters can mount on any substrate and we can mount BIG! Up to 40"x60" can go in our press, no problem! Framecrafters uses nothing but the highest quality glass to protect your work. Framecrafters uses TruVue glass, which is the standard in the industry for picture framing glass. We offer all types of picture framing glass for your project; Clear, Reflection Control, Conservation Clear, Conservation Reflection Control and Museum, as well as all types of Plexiglass and Acrylic both regular and art grade. 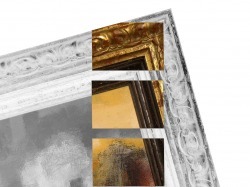 Museum Glass® is the best glazing option for all framed works of art. Museum Glass is the highest quality anti-reflective picture framing glass available in the industry. Tru Vue® has a proprietary manufacturing process, called Magnetron Sputtering, which produces an ultra protective, nearly invisible finish. 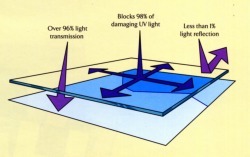 It protects against 99% of harmful indoor and outdoor UV light rays and has the highest light transmission along with the lowest reflection rating of any other glass product. The result is consistent, durable quality and the most attractive display for artwork. To learn more about Museum Glass for Your Home just click here.